I've just started using PyCharm for windows, and have also downloaded Pylint. Is there a way to configure Pycharm to use Pylint on my code? Can it be automated somehow? You can configure pylint as an external tool (Settings | External Tools). I'll try and configure it now, though it's great to have PyCharm cover that as well. I've found an useful project on this subject. 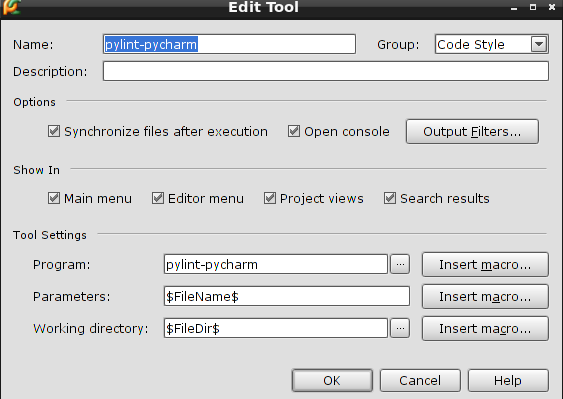 Is there a way in PyCharm to integrate Pylint a bit tighter then an external tool? For example: Pylint output is parsed by PyCharm and is clickable, or even better: inspections are shown according to pylints output. I am using Debian and PyCharm version 2016.1.2. I find that PyCharm's code inspections fall far short from what pylint offers. Particularly when you consider radon and mccabe support. I would very much like to see either better support for external linters, or, a lot more functionality built into PyCharm's own inspections. Any updates on this? I would like to run pylint from PyCharm and get hints and highlights directly. I too ended up here looking for PyCharm support for pylint's output-format=parseable option. It would be very nice to have the output better integrated into the IDE. Any news here? I'd really also like to see a tighter integration of external tools and or pylint explicitly into pycharm.